There are many kids who are always keen to draw some interesting things. Drawing a hobby for many kids. When I was a kid I used to draw cartoon characters from Dragonball. I really enjoyed my drawings and I still have my Dragonball drawings book with me to fresh up my past memories of favorite cartoon character drawings. Drawing is really fun when you are drawing something you like but the main obstacle we face is to draw it perfectly. So, this website easystepbystepdrawings.com is going to teach kids how to draw things perfectly step by step. If you have other things to draw, like slate or Personal computer then you can go with them. 6: Give a finishing touch and it’s done. If you follow the above steps then you can draw anything you want. You just need to make sure that you analyze the drawing before you start. And always remember that you are drawing things lightly in the beginning so that useless drawings marks can be erased easily. If you draw things dark from the beginning then while erasing the paper may get damaged. Now I am going to show you Easy Step by Step Drawings for many different things. Keep all your drawing kit ready! Below you will find some simple drawings for kids explained step by step. You will learn to draw, a Mouse, a Bird, Dora, Sea Turtle, Shark, Rose Flower and a cute puppy. Drawing of a mouse is one of the simple drawings for kids. Kids love to draw simple structures. A total of 6 steps are involved to dram the above mouse. Read the below steps carefully and start drawing. 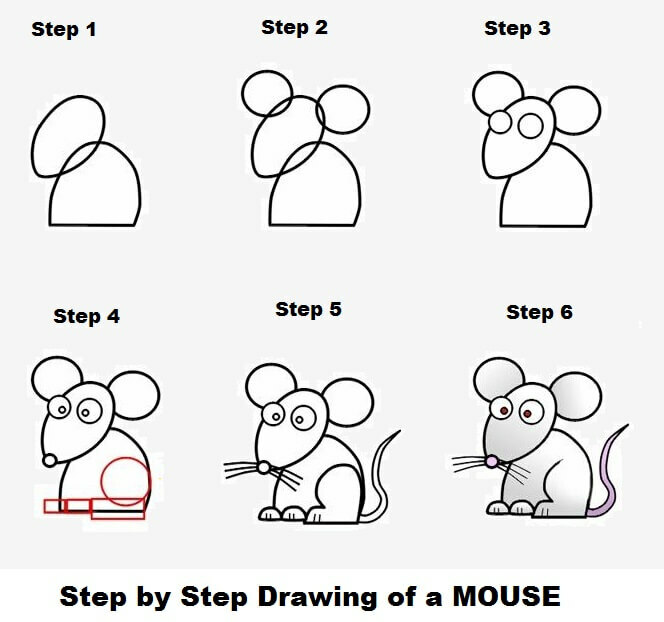 Step 1: In the first step draw the head and the body of the mouse as shown in the above image. Step 3: Draw 2 circles that are meant to be the eyes for a mouse. Draw it properly as shown in the above picture. Step 4: Now draw the inner circle in the mouse eye and draw a circle at the edge of its checks so that it looks like a nose. Also, draw legs and create square boxes. Step 5: Now draw mustache of the mouse and also draw its tail. Do it carefully so that it doesn’t ruin your drawing. Step 6: This is the final step in the drawing of a mouse. In this, you need to color your mouse with the colors you like. Now the Easy step by step drawings of the mouse is completed. Be happy if your mouse looks similar to the above one and share it with your friends. Let’s draw a bird now. 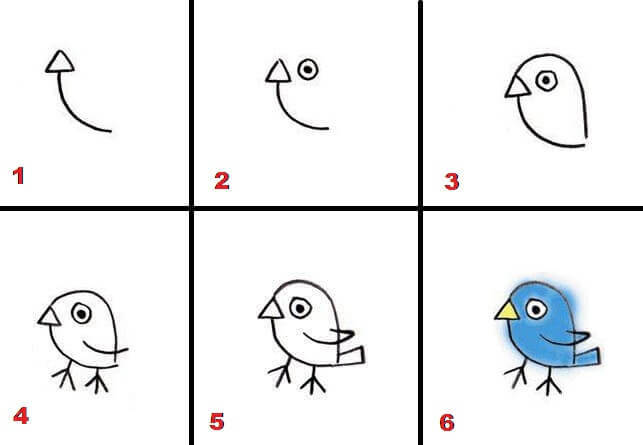 To draw this bird there are six steps involved and it is really simple. This bird is one of the simple drawings for kids. Step 1: To draw a bird you need to draw a curved arrow and the tip of the arrow should be a triangle in shape. Step 2: Beside the arrow draw a circle and within the circle draw a bold point, it is the eye for the bird. Step 4: Draw the legs for the bird. First, draw two straight lines and then draw two slant lines as shown above. Step 5: In the fifth step you need to draw tail and wings of the bird. Step 6: This is the final step and in this step you need give your bird color. Paint the beak of the bird with yellow and other parts with blue color. You can try any color you like. So the easy step by step drawings of Bird is now completed. If you have drawn it in the same way like here then show it with your friends and teach them how to draw it. Let me tell you, She is as “Dora the Explorer” and she explores different places. Many kids love Dora. The easy step by step drawings of Dora the explorer is described below. It involves a total of 8 steps. Step 1: In the first step just draw a wide “U” shape as shown in the figure. Make sure that you draw it lightly in the beginning. Step 2: Within the “U” shape draw two horizontal oval shapes, which act as eyes. Step 3: In the third step draw circles inside the oval shapes that you had drawn earlier. Step 4: Now, inside the circles draw bold dots to complete the eye. Step 6: In the 6th step complete the mouth of Dora. Step 7: Now draw the outline of hairs. Step 8: In the final step draw the inner hairs. Finally, you have drawn Dora. Isn’t is really simple? Now let’s draw a sea turtle. We will draw this turtle in a total of 9 steps. Keep your drawing kit ready! Step 1: In the first step draw the upper part of a turtle. Make sure that you draw the exact shape as shown in the above diagram. Step 2: Now draw mouth of the turtle, which looks like reverse “U” shape. Step 3: In the third step draw the right hand of the sea turtle. Step 4: In the 4th step draw the other hand and 2 legs of the sea turtle. Step 7: Now draw a hexagon and two lines within the body of the turtle. Step 9: In the final step draw the inner and outer circle of the turtle. Now you can color the turtle with your favorite colors. Hence, easy step by step drawing of Sea-Turtle is completed. Share it with your friends if it looks good and teach them how to draw. 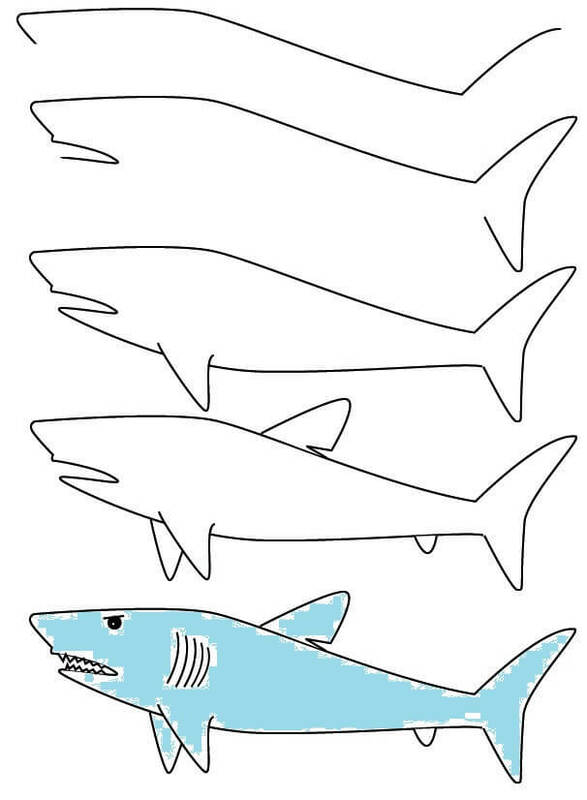 To draw the below shark you need to complete it in 5 steps as shown in the below image. Later you can color your shark with your desired colors. Drawing the below shark is one of the simple drawings for kids. To draw the below flower 6 steps are involved. It is one of the simple drawings for kids and mostly girls like to draw flowers. After you have drawn the flower, color it’s leaves with red color and stem with green color. I will look perfect. Drawing this cute puppy may feel difficult but you can draw it by following each step properly. It will really look perfect after finishing the color. So, these are easy step by step drawing for kids. You can share this with your friends so that they can learn too. To learn drawing perfectly, learn to draw everything step by step. If you have any doubts then you can comment below.